will include an “SOS” function, which lets you hold down the Apple Watch’s side button to call 911 (or whatever other emergency service) when needed. Aside from allowing Apple to play nice with certain laws abroad, this should be very appealing to runners, or just anyone who doesn’t want to be tethered to a smartphone when they’re out and about. There’s a small problem, though: The Apple Watch can’t make calls. Or at least, not on its own. Instead, per usual, it needs to be paired to a phone over Bluetooth, or have a strong enough WiFi signal to use WiFi calling. While the shortcut is still appreciated, neither of those are all that foolproof if you want to go for a jog without your phone clanking around. This doesn’t mean the feature is too good to be true, though. If you really want a watch that can work independently from your phone, especially for the sake of making emergency calls, you might not know that a couple already exist: LG’s Watch Urbane 2nd Edition LTE, and Samsung’s Gear S2 3G. Those wearables, which are not at all confusingly named, can make and receive calls without having to be tethered to your phone. They have speakers and microphones and their own SIM cards, so if you break an ankle on your run, you don’t have to pray you’re in WiFi range to call for help. You have to set them up with your phone first — and it’s crucial to note that these two do way more with Android than iOS — but they do work. They also show why making a smartwatch more like a smartphone can be complicated. For one, there are hardware issues. 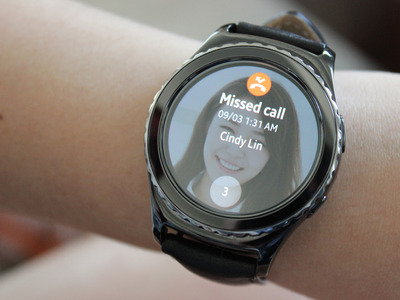 Cellular tech takes up space, and many smartwatches aren’t all that svelte in the first place. It’s a similar deal with battery life: Most of these things (Pebble aside) only last couple of days, max; making calls and using data brings that down to a matter of hours. Then there’s the fact that carriers still exist. As you might know, phones and their requisite plans aren’t always cheap. A smartwatch that does phone things isn’t either — the Watch Urbane goes for either $200 with a 2-year contract or $360 without, while the Gear S2 3G is about the same. In either case, you pay another $5 or $10 per month (depending on carrier) on top of your existing phone plan for data. Only one carrier (AT&T) makes it so you can sync your phone number to your watch number, too. That said, if you like the idea Apple is getting at with its SOS feature on the Apple Watch, you have a couple of more actualized alternatives out there. Just know that we’re still a little ways away from the fully independent smartwatch becoming a totally harmonious thing.